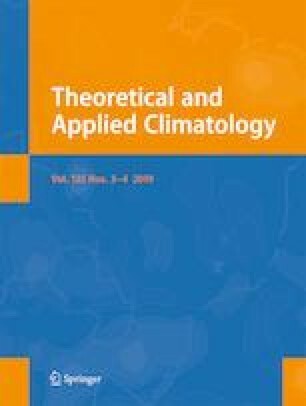 In this study, the Sudan low and the associated Red Sea trough (RST) are objectively identified using the mean sea level pressure (SLP) data from the National Center for Environmental Prediction/National Center for Atmospheric Research (NCEP/NCAR) reanalysis dataset covering the period 1955–2015. The Sudan low was detected in approximately 60.6% of the autumn periods, and approximately 83% of the detected low-pressure systems extended into RSTs, with most generated at night and during cold months. The distribution of the RSTs demonstrated that Sudan, South Sudan and Red Sea are the primary development areas of the RSTs, generating 97% of the RSTs in the study period. In addition, the outermost areas affected by RSTs, which include the southern, central and northern Red Sea areas, received approximately 91% of the RSTs originating from the primary generation areas. The synoptic features indicated that a Sudan low developed into an RST when the Sudan low deepened in the atmosphere, while the low pressures over the southern Arabian Peninsula are shallow and the anticyclonic systems are weakened over the northern Red Sea. Moreover, stabile areas over Africa and Arabian Peninsula form a high stability gradient around the Red Sea and the upper maximum winds weaken. The results of the case studies indicate that RSTs extend northward when the upper cyclonic and anticyclonic systems form a high geopotential gradient over Arabian Peninsula. Furthermore, the RST is oriented from the west to the east when the Azores high extends eastward and the Siberian high shrinks eastward or shifts northward. The authors are grateful to King Abdulaziz University for providing the facilities and logistical support for this study. The authors also acknowledge NASA and NCEP/NCAR for providing the meteorology data through their websites.